Curious. 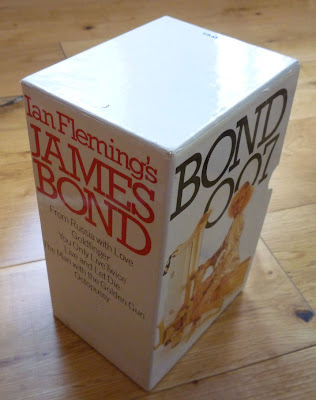 Presumably there was more than one version of the box. 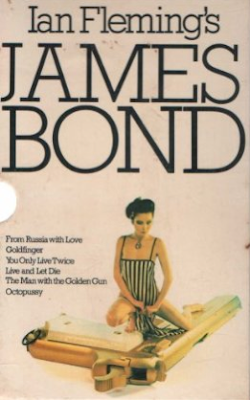 And it's an odd selection of books inside, too; why no Casino Royale, or Dr. No? Mind you, I think the Panther editions were published out of sequence anyway, so perhaps the books in the box were the initial six that Panther issued. I went into the creative process behind those glorious Beverley le Barrow photos in the previous Bond/Panther post, but I can add a tiny detail about the Goldfinger cover (duplicated on the box itself): the gold goblet the model is holding and the champagne bucket at her feet were supplied by luxury goods emporium Aspreys of Bond Street, London. 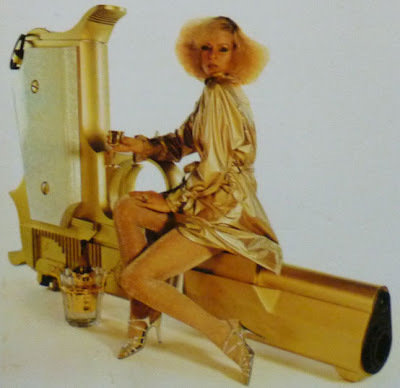 So, what with the Terry de Havilland shoes and Hooper Bolton jewellery, this was one classy photo shoot. I have no idea how sought-after or collectable this box set is, or how much it's worth. 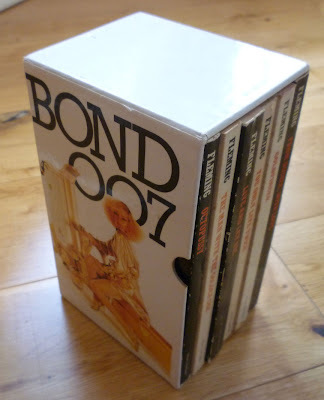 There aren't any for sale on Amazon or AbeBooks; I got this one for £4.50 from a seller on eBay who had simply called it "bond box set" or something, which wouldn't make it easy to find for any 007 collector (I just happened to stumble upon it). But it's a fun thing to own, nevertheless. 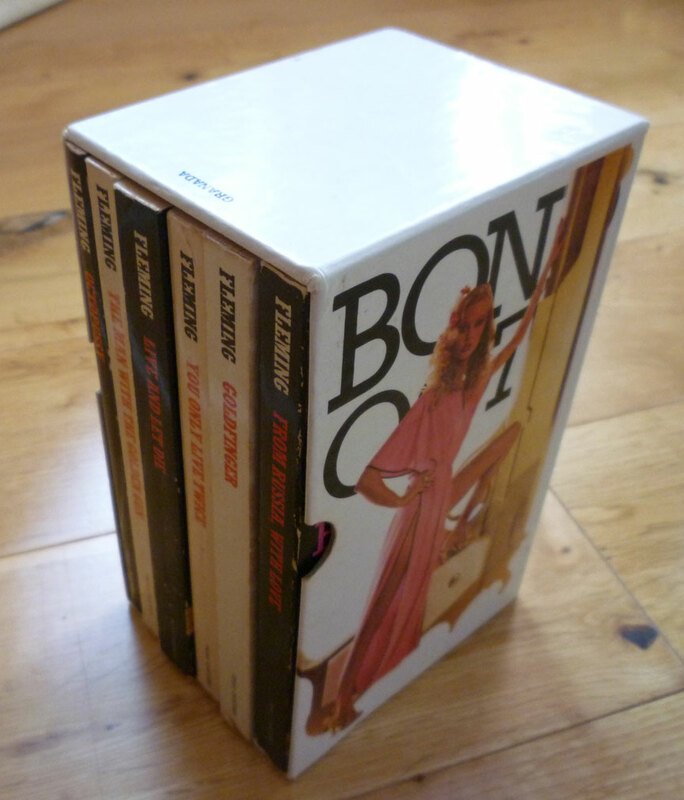 good luck finding the other half and cheers for finding them in a box set! They're a little easier to come by here in the UK, Anonymous; you can pick most of them up via Amazon Marketplace fairly cheaply, or indeed in charity shops and secondhand bookshops, which is where most of the ones in this post (the ones with back covers showing, that is) came from. 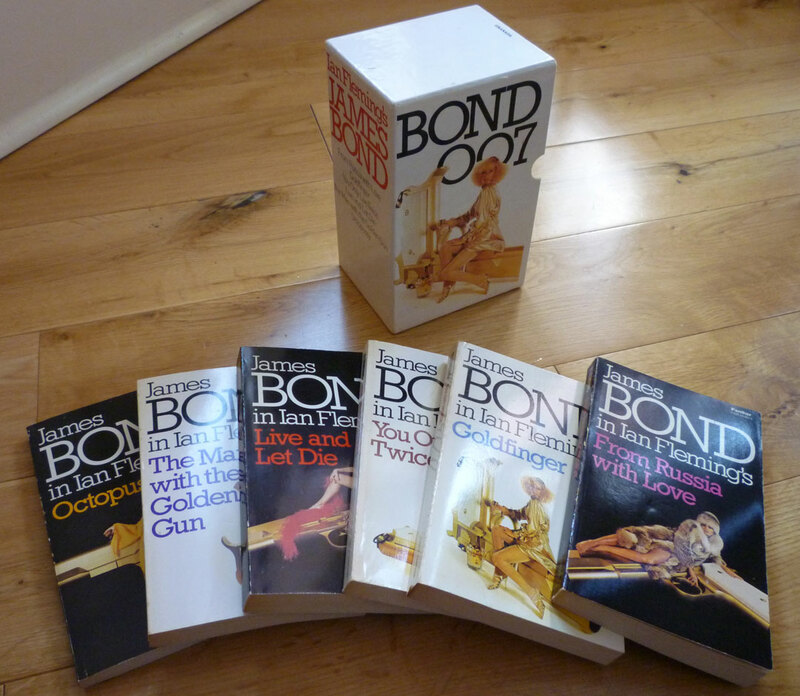 And as you can see from that post, I do have other Bonds with this style of cover – and with other covers too!